← Is the world going nuts, or has it been that way for a long time? Many Palestinian supporters claim that she is. A couple of videos I found both interesting and inspiring (tip of the hat to Israelycool) are embedded below. First, here is an explanation of why I found them so. The videos appear to have been professionally and skillfully made, featuring IDF members rather than actors and actress. The prominently featured young lady is a non-commissioned officer in “one of Israel’s elite anti-terror units.” An Arab Christian, she was not subject to conscription and asked to enlist. Why the IDF would support or produce such videos? ♦ To help with recruitment, particularly from within the Arab community? Probably. ♦ To counter “apartheid” slanders coming from multiple external sources? Probably. ♦ To disabuse Israelis and others of erroneous notions that they accurately express the anti-Israel views of all or even most Israeli Arabs? Probably. That, standing alone, would make the efforts worthwhile. Israeli Arabs who claim to despise Israel exist. There are twelve Arab members of the Knesset, some of whom frequently disparage Israel as “racist” and otherwise illegitimate. Inconsistently, they object strenuously to having parts of Israel where they live become parts of a Palestinian state. Renewed talk of land swaps between Israel and a future Palestinian state has left many Israeli Arabs worried about losing their status as citizens of Israel. The new-old proposal has been strongly rejected by leaders of the Israeli Arabs, who expressed outrage over the idea. It was hard this week to find even one Israeli Arab who publicly supported the proposal. “This is an imaginary proposal that relates to the Arabs as if they were chess pieces that could be moved around according to the wish of the players,” said Ahmed Tibi, an Arab member of the Knesset. His reference to Israel as a “democratic state” is illuminating. Both Tibi and Ighbarriyeh are from towns in the triangle area; Taybeh and Umm al-Fahm. The Knesset has 120 members, 12 of whom are Arabs. Some of the Arab parliamentarians have over the past two decades acted and spoken in a way that has caused damage to the interests of the 1.5 million Arab citizens of Israel. These parliamentarians have, in fact, spent more time defending the interests of the Palestinians in the West Bank and Gaza Strip than those of their voters. Assuming a modicum of sanity, why should Israeli Arabs want to live in a Palestinian state instead of in the only prosperous, reasonably free and democratic state in the region? Why, for that matter, should any reasonably sane human neither infected with the Islamic Jihad disease nor coveting the power associated with generous financial support from Islamist states want to live in a Palestinian state? With that background, here are the videos. She describes the nasty comments some Arabs made to her and her family members when she signed up. She dismisses them. And her parents are squarely behind her. “Israeli Arabs need to serve in the Israeli military,” she insists in the interview, “to give to the country and not just take.” Israel is our country and we need to serve it, she believes. And military service is beneficial for those who serve, she adds, teaching them discipline and responsibility. Monalisa’s older sister Michelin, age 21, has also decided to enlist and will start her service in a few days. In the same unit as Mona. 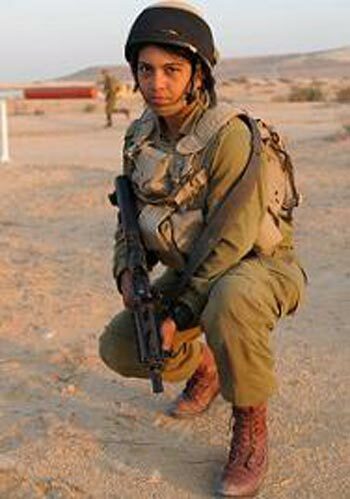 Monalisa not only asked to enlist in the Israeli Defense Forces but signed up for an elite combat unit named “Karkel,” in which both men and women serve side by side on the front lines. Karkel is the name of a wild desert cat that lives in Israel’s south. The unit is station in the Arava desert close to the border with Egypt. Hunting down terrorist infiltrators is its specialty. Monalisa provides an interesting, even compelling, contrast to Arab members of the Knesset and other Palestinian supporters who disparage Israel as a “racist,” apartheid and otherwise illegitimate state. Of greater importance, perhaps the videos featuring her will help to convince Israelis and others who accept their words as accurate and as reflecting the views of most if not all Israeli Arabs that they are neither. This entry was posted in Antisemitism, Brain washing, Christians, Cultural differences, Democracy, Duty, Equality, Europe, Freedom, Honor, Ideology, IDF, integration into society, Integrity, Islamists, John Kerry, Law and Order, Libruls, Middle East, Military, Netanyahu, Obama, Obama's America, Palestine, Palestinian Authority, Peace process, Political Correctness, Politics, Shari law and tagged Arabs, Christians, IDF, Israeli, Jews, Palestinians, Peace Process. Bookmark the permalink. There’s something bent in the brains of some Israeli Arabs. They live in a democracy and reap the benefits, but some of them spend a lot of time trying to tear it down and demonstrate how terrible it is. Come to think of it, the same thing can be said of some American leftists….